Standard vs. Premium, Topographical vs. Geopolitical. What's the deal? Since 2018, the Premium mapset has the best features of our Topographical and Geopolitical maps, showing the contours of the Oceans and Geopolitical spectrum of countries. The great mountain ranges of the sea are shown along side the peaks upon the land. Oceanic and human geographic datapoints, like major shipwrecks, coral reefs, nuclear disasters, and spaceports. These are the mapsets used in our Geochron Digital 4k. Until 2015, the Geochron had only been built around a Geopolitical mapset. It’s a map the represents the world by human boundaries, and it’s updated regularly. Our premium mapsets combine the contours of the ocean with the topography or geopolitical details of the land, and are several orders of magnitude deeper in color and depth. Topographical reliefs of the land. The Earth Limited Edition Geochron (25 of 25) mapset was a photographic quality mapset that actually was developed in a six foot long bathtub in a dark room after printing, and are made occasionally available by Geochron as a very limited reserve because we can’t make any more. But our Premium mapsets are very similar, and even brighter in color and contrast. Both the Premium and Earth Limited Edition mapsets are superior in color and detail to the Standard mapsets. for 50 years, and were run on huge multi-color offset printers. Geochron began experimenting with newer printing technology in Limited Edition clocks. The results were fantastic, but expensive. Geochron now offers a premium mapset for all restorations and non-vinyl clocks. The premium mapset comes with an updated world map that combines the ocean topography with the land. Deep blue ocean trenches contrast with the deserts and mountains of our geopolitical map, with greater depth and color than ever before. as an upgrade to all restorations and new clocks with specialty panels (wood, steel, and stainless). Premium mapsets are standard on Boardroom Geochrons and Live Edge. They are not available on vinyl panel clocks. What is a combo mapset? Every Geochron ever made actually contains three maps, hand spliced together in a loop six feet long. The map continuously scrolls, at one inch per hour, showing three maps over three days. Every three days, you’ll see the same map come around the loop. A combo mapset is a combination of our geopolitical and topographical mapsets. 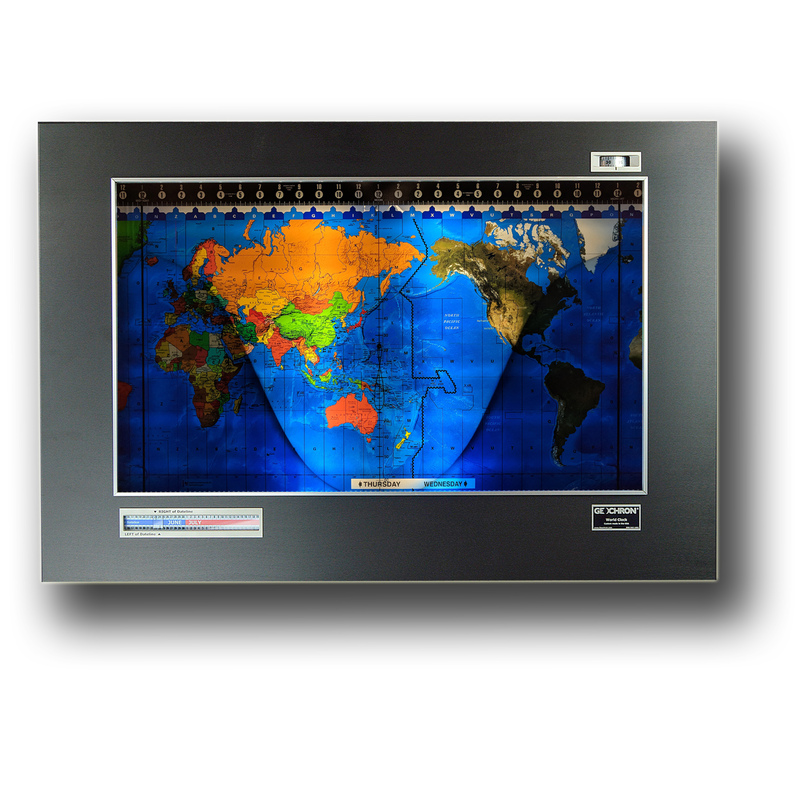 The picture below is a splice between a standard geopolitical map panel and a standard topographical map panel, making a combination mapset.